1| It's a cheap way to get around! 2| Cycling is quick, saves time and you can always find a parking space. 3| Gives you precious time to exercise together as a family. 4| You can fit exercise into your daily routine. 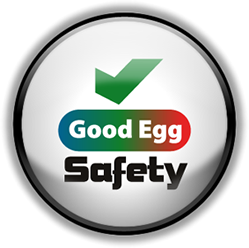 Written by people who are passionate about cycling, The Good Egg Guide to Cycling for Families contains expert tips and advice about how to buy, ride and stay safe on a bike. Whether riding through rush hour traffic, staying fit and healthy, or simply having the freedom to explore the local area, regular cycling is the perfect activity to build into your family's routine. Not only is cycling beneficial to the environment, making cycling part of your daily commute is a great way of taking regular exercise. 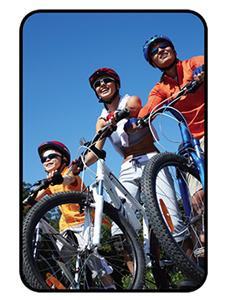 A family bike ride is also an ideal way of sharing time together. Encouraging your children to cycle with you increases their confidence and enables them to develop safe habits that will last into adulthood. Cycling is one of the simplest lifestyle choices we can make to reduce our impact on the environment. Bicycles can travel almost 1,000 miles on the equivalent energy of a gallon of petrol. Most journeys of fewer than seven miles can be made by bike in less than one hour - ninety per cent of all commutes are within five miles!